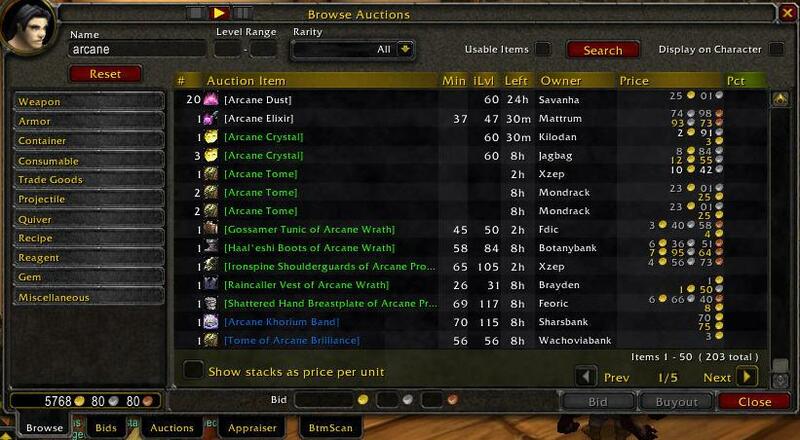 I used to love the feature of Auctioneer that would price my items when I wanted to start a auction and undercut by 5% now it don't do this at all and apraiser is never cheapest so any idea whats wrong if its on my end or when it will be put back in if its on yours? PS - Change the scale in SetScale for whatever you want (the default window is 1.0). I think 1.3 is good, but some prefer 1.2. I left blank line 382 propositally. Please know that we have tested the suites labeled 2887, and a few later versions, on the latest 2.4 patch of the test realm and there are no issues or errors. We will endeavor to ensure the suite is tested and set should there be any further modifications before 2.4 is released. To avoid any issues, you may want to be sure that you have the "Load Out of Date" AddOns check box selected in the main AddOns screen. You can access the AddOns control from the Addons button in the lower left corner of the Character Selection screen. Not sure if you've added this option..
How do you turn off all the text spam in the chat log when doing searches? It says stuff like.. I don't need to see those stats, so can I hide em? 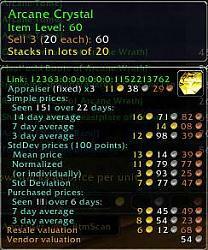 All you need to do is access the Auctioneer Advanced options via the "Configure" button on the top of the Appraiser frame when at the AH or by pressing the "Auctioneer" button on the SlideBar, located just below the minimap by default. Once you have the options settings open, the setting is under the main set of configurable goodies -> Core Options -> General -> and then *uncheck* the "Show End of Scan Summary" checkbox. Please note that the Auctioneer Advanced files here at WoWInterface have been updated to the very latest versions- 2953 - and are fully 2.4, SunWell, compliant. Should you run into any errors, be sure you have updated to the most recent version, since that is the first thing we will ask if you require help. Also, remember, to avoid many issues, you want to be sure that you have the "Load Out of Date" AddOns check box selected in the main AddOns screen. Got it to work, nevermind.